The turkey is coming, juicy and succulent. And it is logically followed by a mountain of leftover meat. Once you have enjoyed a hot gravy covered sandwich the big question is what to make out of the rest of the bird. The other day I made oven roasted chicken pieces and found myself with one last leftover piece. I decided to make a salad out of it. What I created was so tasty I instantly knew what I was going to make using some of my turkey, a fruity crunchy salad that is a meal in a bowl. 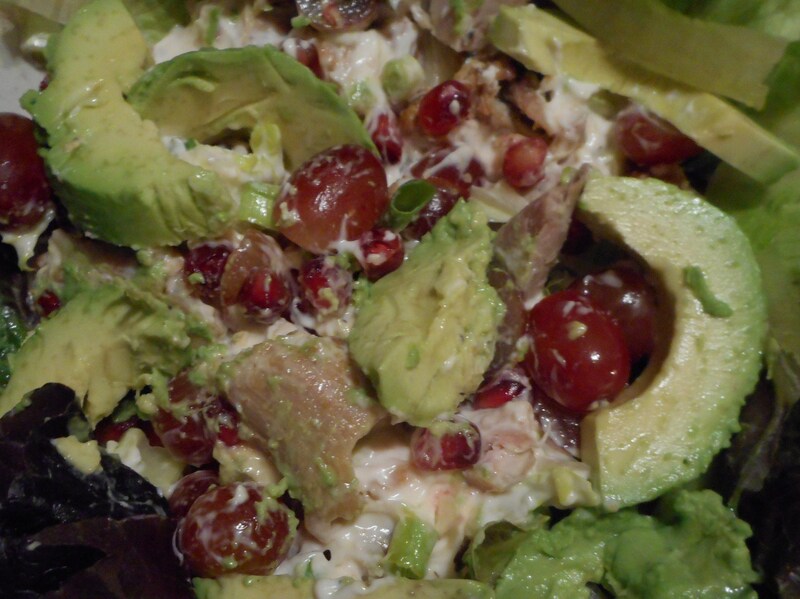 It is a riff on that classic chicken salad with grapes which was popular for many years; I updated it with a sprinkle of pomegranate seeds and slices of creamy avocado. Both add color and great flavor. If you don’t like avocado; just leave it out although I think you should try it at least once: avocado is really good for you and you may suddenly decide you like its smooth contrast to the rest of the salad. I much prefer the Hass avocado; smaller with pebbly skin. Pick one with a slight give, not hard as a rock nor mushy or about to cave in. 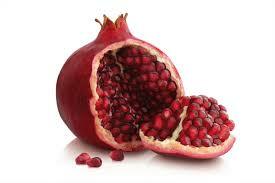 The pomegranate seeds are mostly there for the color burst they give and there is some crunch and flavor I enjoy too. To get at the seeds I usually cut carefully into the skin and peel it back in two places to make a wedge of exposed interior. Then i break it open and pick out the seeds. I only pick out what I am going to use and put the rest of the pomegranate in a plastic bag and store it in the fridge. There are U-tube videos on how to easily get at the seeds if you want to check them out; might be easier. When choosing a pomegranate pick one that feels heavy for its size, the skin should not be dull or damaged, no soft spots and the color is a vibrant red. Fall is the season for pomegranates; don’t look for them in June. I have and they are very hard to find after winter ends. But do leave in the grapes and nuts and the celery. They are essential to the flavor and crunch of it. I used Light Hellman’s mayo, less calories and I like its texture and flavor. This is a sort of approximate recipe; everyone has their own idea on how much mayo, how many grapes, and how much mustard. I am giving a middle ground amount in a recipe for one dinner sized salad. Adjust to your tastes and feel free to double it or triple. Directions: Cut up roasted turkey or chicken to make ½ to 2/3 cup of small pieces, half inch to inch sized. Put them in a mixing bowl. Add ½ a tsp of Dijon or whole grain mustard, 2-3 tbsp. good quality mayonnaise, ½ to 1 tsp red wine vinegar, one stalk celery cut into small slices, a dozen grapes cut in half, a ¼ cup of pomegranate seeds, 2 tsp. of walnut chunks. Stir it to blend and meld it. Tear up 3-5 leaves of romaine or loose leaf lettuce and lay in your shallow big salad bowl. 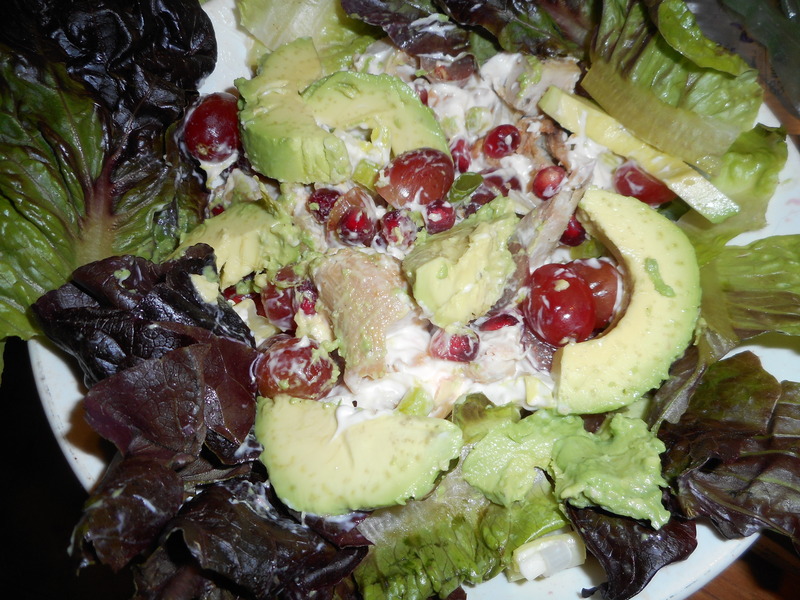 Top with the chicken/turkey salad and then a few thin slices of avocado and the sprinkle of ruby pomegranate seeds. I used some red leaf romaine I got at Valley Farm Markets, great crunch and color. Use whatever kind of lettuce you like although iceberg would be my dead last choice; less flavor and nutrition in iceberg. This makes a great lunch full of protein and healthy veggies. It is simple to make, elegant looking and very yummy. Now you have one more turkey option for all those leftovers next week! Actually this salad is great anytime, not just after the Thanksgiving feast. Enjoy.